Keeping up with your vehicle’s Scheduled Maintenance is the best way to keep your Audi delivering all the performance and passion you love. It’s also a great way to help protect the value of your vehicle and your investment. Here in Calgary, it is all-the-more important to take special care of these kinds of vehicles, with our harsh climate and road conditions. Euroworks recommends you bring your Audi to our facility to ensure that vehicle repairs are performed to the highest specifications and while you're at it you can have it protected from rock chips with our unique Paint Protection Films. Euroworks has the proper tools and equipment, trained specialists, and access to the extensive range of parts necessary to properly maintain your vehicle’s safety, reliability, and value for years to come. Audi Oil Service This service is the most frequent and least costly service. The Service Interval System will let you know when it is time to change your oil, but a typical interval on a modern Audi will be 8,000 - 10,000 km. Timing Belts should be replaced at 150,000 km on TT's (or) 205,000 km on A3 2.0L TDI only. All Models check condition of timing belt tensioning system, dampening pulleys and idler pulleys and replace if necessary. Check Crash Active Headrest function every 2 years regardless of kilometers (A8 only). 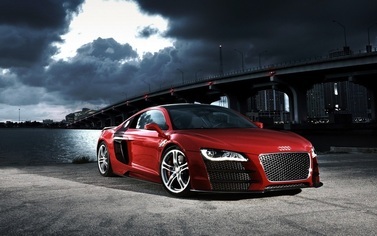 The R8 brought Audi to the forefront of the performance world, as they brought the race car to production. The car was exclusively designed, developed, and manufactured by Audi AG's high performance private subsidiary company, quattro GmbH, and is based on the Lamborghini Gallardo platform. The Audi R8 without exception is one of the finely-tuned sports cars in the world and uses fundamental construction which is based on the Audi Space Frame and uses an aluminium monocoque which is built using space frame principles. Servicing your Audi R8 requires more diligence and care, please contact our Euroworks Service Department for further info.